Drivers for more than a generation have lauded the Mazda MX-5 Miata, colloquially known as just the Miata. The car has made great strides in recent years to become one of the premier roadsters on the market. It is of the highest quality and remains one of the most affordable vehicles in its class. The new 2018 Mazda MX-5 Miata starts at an MSRP of $31,910 and comes with a plethora of standard features. MAZDA CONNECT™, the automaker's groundbreaking infotainment system, allows all Miata drivers to keep in touch with their favorite apps like music, navigation, and messaging. Other standard inclusions are Bluetooth hands-free phone and audio streaming, Bose audio, leather bucket seating, integrated headrests, automatic emergency notification, and SiriusXM satellite radio. You might expect a sports car to have some respectable engine specs. The ultra-compact Miata features two trim levels, the Club and the Grand Touring. Both trims showcase the same 2.0-liter inline-four engine that is powered by 155 horses and produces 148 pound-foot of torque. As one of the most efficient vehicles in Mazda's lineup, the Miata averages up to 35 highway MPG. Not only will you show off a coupe with great style, but you will also save money by taking fewer trips to the gas pumps. 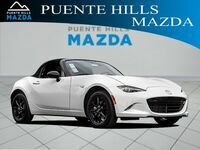 The 2018 version is better than ever, so come by Puente Hills Mazda and see it for yourself! 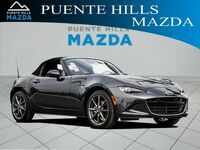 You can read about features and engine specs all day, but you won't truly understand how fun the Miata is to drive until you get behind the wheel. Experience the adaptive lighting, available heated seats, and LCD displays by scheduling a test drive online or by giving us a call at (626) 701-8905. Our sales staff will go over all of the details you are looking for. We will answer any of your remaining questions and go through pricing, financing, and leasing options. Come by soon or give us a call. Either way, we hope to hear from you soon!